Lime columns method is a variation of deep soil mixing, in which unslaked quicklime is used instead of cement or mixed with cement. The lime columns are suitable at best for stabilization of deep soft clay deposits. A pozzolanic reaction takes place between the lime and the clay minerals resulting in substantial increase in the strength and reduction in the plasticity of the native material. The heat generated by hydration of the quicklime also reduces the water content of the clayey soils, resulting in accelerated consolidation and strength gain. Lime columns can be used for load support, stabilization of natural and cut slopes, and as an excavation support system. Heat of the exothermic reaction of lime and/or cement with soil water reduces soil moisture content thus increasing strength. Clay chemistry ion exchange from sodium to calcium causes particles to aggregate increasing permeability. 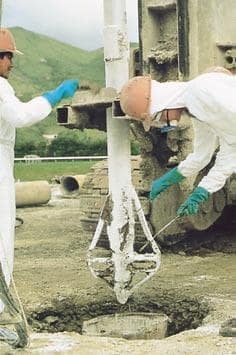 Cementitious effect of calcium in lime. The net effect is a series of columns with increased shear strength and higher permeability. Column diameters in excess of 500mm and depths to 15m can be easily achieved. Lime columns are appropriate for soils containing at least 20 per cent of clay, and the content of silt and clay should be at least 35 per cent. Gypsum can be added to help stabilize organic soils with moisture contents of up to 180 per cent. When gypsum is added to the lime, undrained strength can be three times that when lime is used alone. Lime columns are particularly effective where there is a high ground temperature, because the rate of hardening of the columns is faster. A disadvantage of lime columns is that they can act as drains, and their bearing capacity can decrease with time because of leaching by slightly acidic ground waters. The lime/clay mixture may be more frost-sensitive than soil on its own. Sometimes the column material appears as matchbox-size lumps, a result of variations in chemical reaction. Alternatively, it can be cracked in layers at every 20-50 mm and be weakest in the center. For these reasons, tests on laboratory mixtures often do not compare well with samples from the field or field tests.